A referendum to gauge whether Milwaukee County residents support the legalization, regulation and taxation of cannabis could come before voters as early as this fall. The measure will be added to the Nov. 6 ballot pending approval by the Milwaukee County Board of Supervisors at its next meeting May 24. On May 10, the County Board’s Judiciary Committee unanimously recommended a resolution, which would create the referendum, to the full Board. That vote came just days after a large pro-cannabis rally in Milwaukee, where a diverse group of at least 200 occupied the shadow of the Milwaukee County Courthouse, in 80-degree heat, to call for cannabis reform. 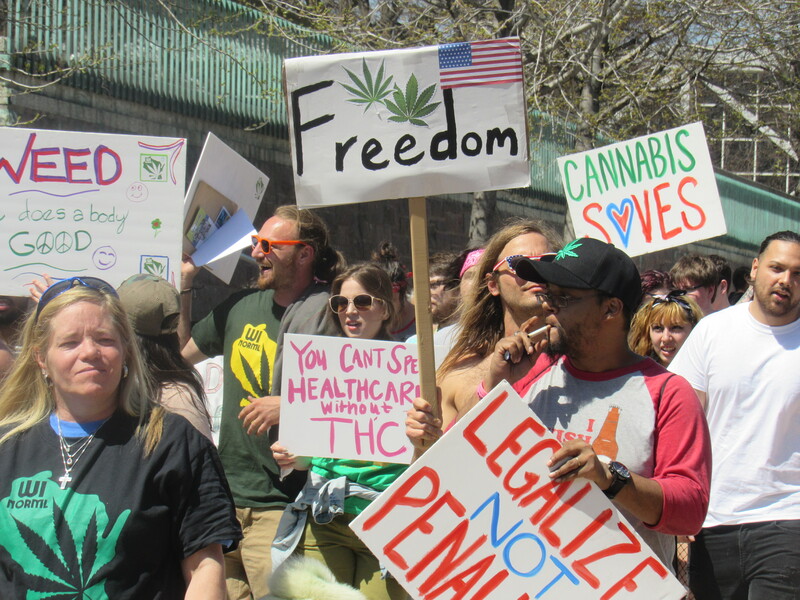 Supporters said legalization could have a positive effect on people’s mental and physical health, as well as efforts to reform the incarceration system. Late last year, Bowen and other Democratic lawmakers introduced Assembly Bill 482, which would have legalized cannabis for medical and recreational use. The bill, which not one Republican supported, never made it out of committee. Bowen said he hopes state legislators “give the issue the real time of day that it deserves” when the new session begins early next year. NORML (National Organization for the Reform of Marijuana Laws), the group that organized the rally, supported Bowen’s bill prohibiting drug testing. Eric Marsch, director of Southeastern Wisconsin NORML, a regional chapter of the national organization, told Milwaukee Stories a successful November initiative could have a domino effect, paving the way for non-violent criminal cannabis convictions to be wiped from the books. In a country known for high incarceration rates, Wisconsin imprisons more Black men than any other state. According to an analysis by the Wisconsin Justice Initiative of 95 arrests in 2015 and 2016, 86 percent of all Milwaukee County cannabis arrests were African-Americans. Several cities, including San Francisco and Seattle, have recently experimented with throwing out non-violent drug offenses. Toward the end of his last term as president, Barack Obama also commuted the sentences of 46 non-violent drug offenders. However, data on the effect of these decisions is hard to find. States where the substance is legal have reaped vast economic benefits. In Colorado, cannabis products created more than $230 million in tax revenue last year alone. Residents and supporters also spoke of other benefits to reform. “For far too long veterans have been prescribed far too many opioids,” Ray told Milwaukee Stories. Ray, a former US Marine and National Guardsmen, stood quietly just beyond the crowd’s perimeter holding a sign that read: “Veterans For Cannabis.” He declined to give his last name. Next PostWill you help us build a movement of community-supported news?